Read on to check out what we thought as well as a gallery of high resolution photos. 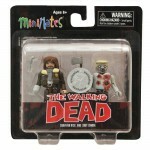 Last week we reported on news of The Walking Dead Minimates Series 4. Now Art Asylum and Diamond Select Toys have released a bit more info. Included is word that Alice will be the variant of the set, replacing Lori Grimes in the variant 2-pack with the Flayed Shoulder Zombie. Check out info below direct from DST. Fans of the Walking Dead TV show may not know how the prison storyline will end, but fans of the comic know that it will probably not end well! The fourth assortment of Walking Dead Minimates, based on the long-running comic book series by Robert Kirkman and Charlie Adlard, features one of the most hated villains in comic book history, the Governor, as well as some of his closest friends and worst enemies. Walking Dead Minimates Series 4 brings re-unites the Governor and his lieutenants with some of the people who hated him the most. The Governor himself comes in a two-pack with his lieutenant Gabe, with whom he stormed the gates of the prison. Michonne, the woman who received the worst of the Governor’s brutality, comes with his accomplice Bruce, as well as a new poncho accessory. Rick’s wife Lori (with baby Judith) comes with a partially flayed Shoulder Zombie, and a variant of that set will replace Lori with the prison doctor and Woodbury defector, Alice. Each Minimate stands 2 inches tall and includes a variety of interchangeable parts and accessories. All of these figures will be available at comic shops and specialty stores this summer. To find your nearest comic shop, visit comicshoplocator.com! 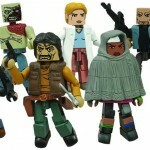 Toyark sponsor Big Bad Toy Store has listed The Walking Dead Minimates Series 4. Not only that, but they have the first photo of the series, which includes highly anticiapted characters such as The Governor. You can Pre-Order The Set Now and look for them this augutst. A Diamond Select Release! Designed and Sculpted by Art Asylum! Here comes the Gov! The toy line based on long-running comic series The Walking Dead is proud to introduce the series’ most famous villain, the Governor, along with two of his henchmen! The assortment includes four different two-packs, including The Governor with Gabe, Michonne (Poncho) with Bruce, and two short-packed, specialty-exclusive sets: Prison Lori with Shoulder Zombie and Alice with Shoulder Zombie. Each Minimate stands 2 inches tall and includes a variety of interchangeable parts and accessories. Read on for the photo.